Happy 2015 everyone! The title is not a typo. 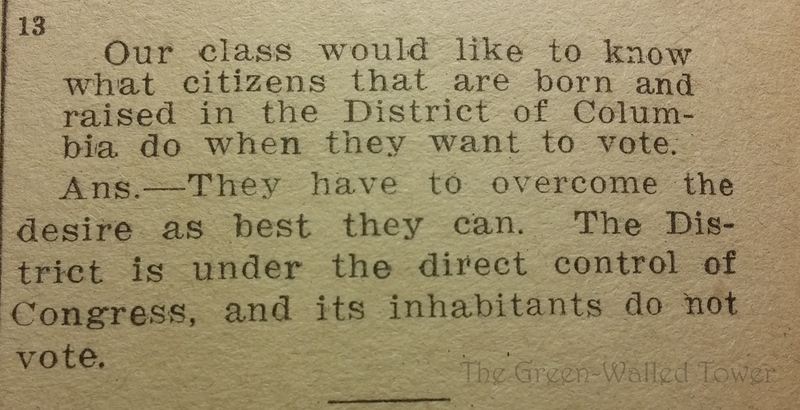 Here is a clip from the magazine Current Events, from January 1, 1915. It talks about how to keep peace for 100 years, referring to the peace between Canada and the US after the War of 1812. 100 years later, our world can still use all the peace it can get. 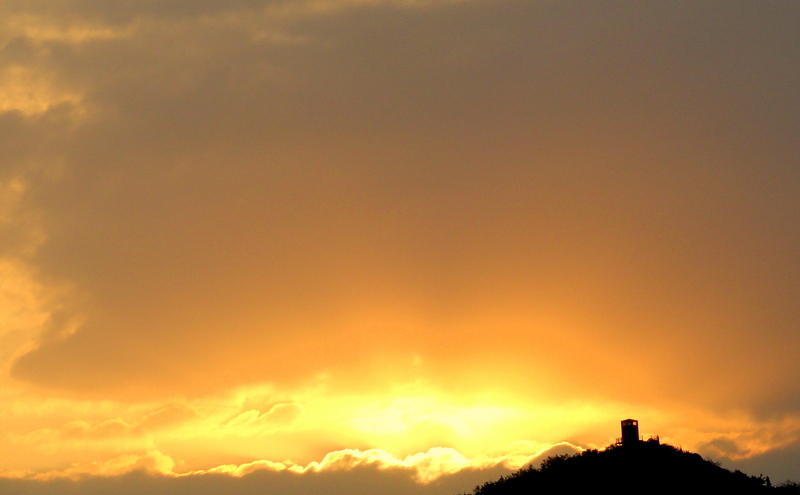 Here’s to a peaceful 2015. It’s amazing the different historical context makes. 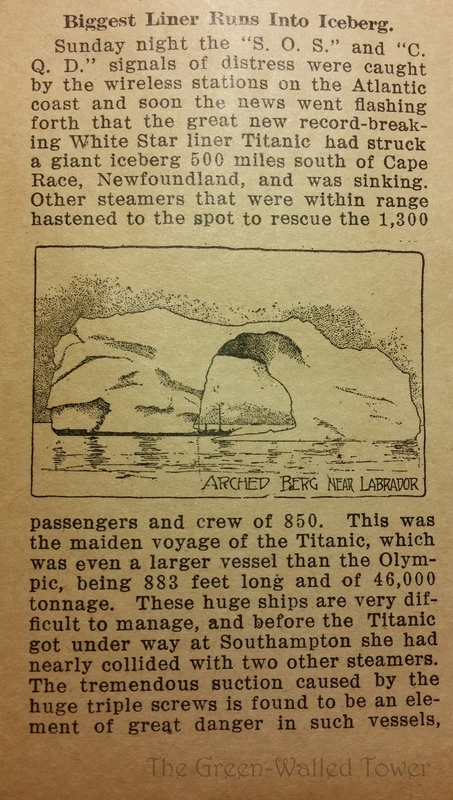 When I looked at the April 20, 1912 edition of a news magazine called the Pathfinder (five days after the Titanic disaster), I expected to see a huge, full-page story. Instead, I found a small account of the accident sandwiched between a section about the rising popularity of Montessori schools and another about how the US is starting to grow its own camphor trees. There was no mention of casualties and merely says that rescue operations are ongoing. 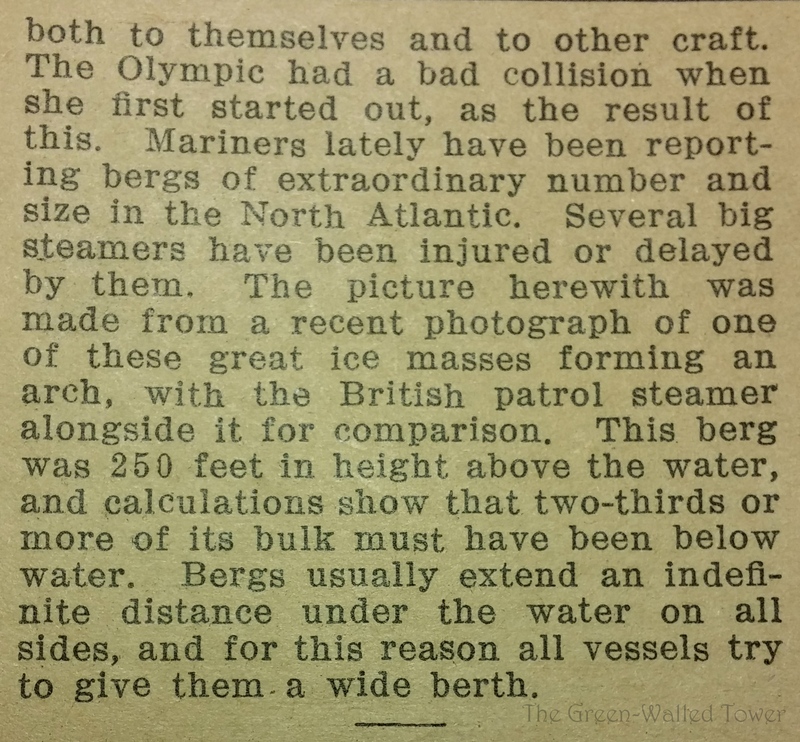 However, when you think of it, the magazine was probably written several days before, when the true details were still unknown. It’s a little chilling, reading it now. Do you remember a time before the Internet? Of course you don’t. Don’t lie. However, there was such a time when you had to look in an encyclopedia to find out something or just live with not knowing it. 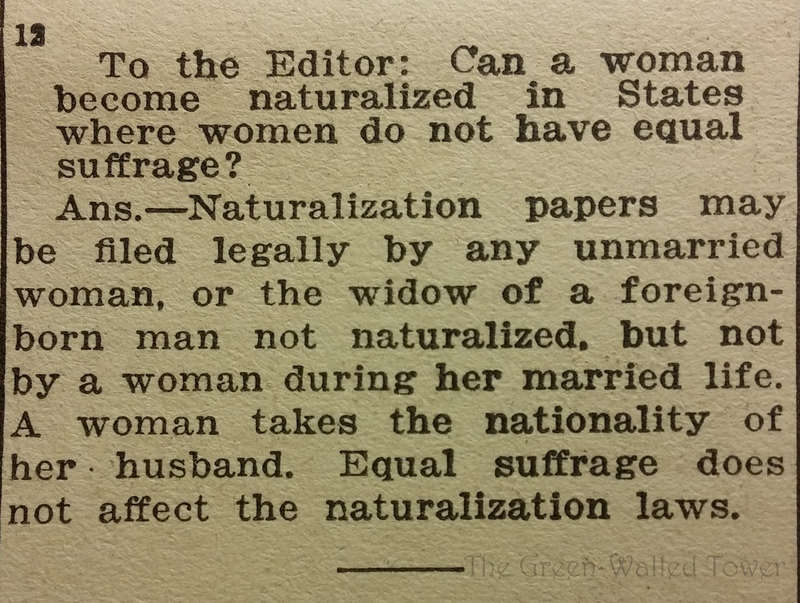 But then, there was also a time even further back when reference books were rare and many people would write into certain magazines with questions that would be answered in a regular column. Now imagine this: you have things you want to Google. Pick just one question and write it down. Mail it to a magazine. Wait a month or two. Hope it gets picked out of the hundreds of others they receive and then gets published for the whole world to see (nothing NSFW). Things have hardly changed a bit! The following are excerpts from a magazine called Current Events. 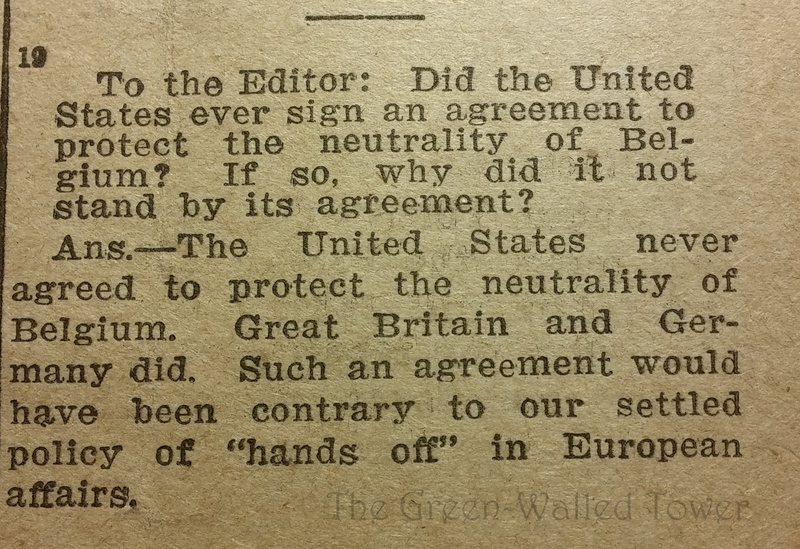 All of these are from 1915, which for historical context means that World War I had just started but the US was still neutral. The questions may surprise you as much as the answers. 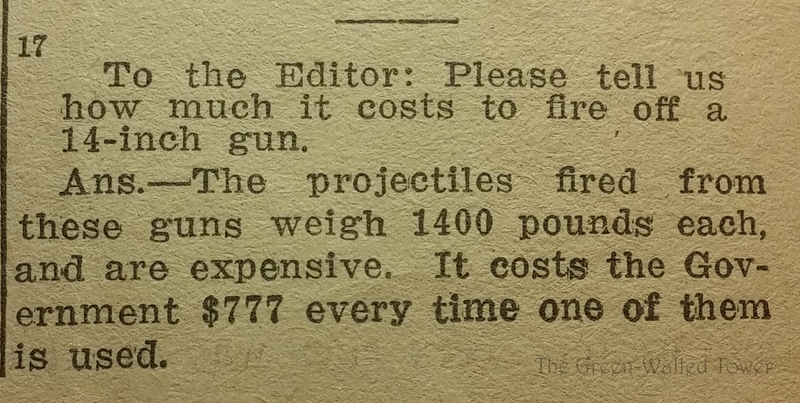 That is almost $18,000 per shot in today’s money. Apparently war has never been cheap. Well, that’s convenient. I think I’d rather . . . not be sued today. 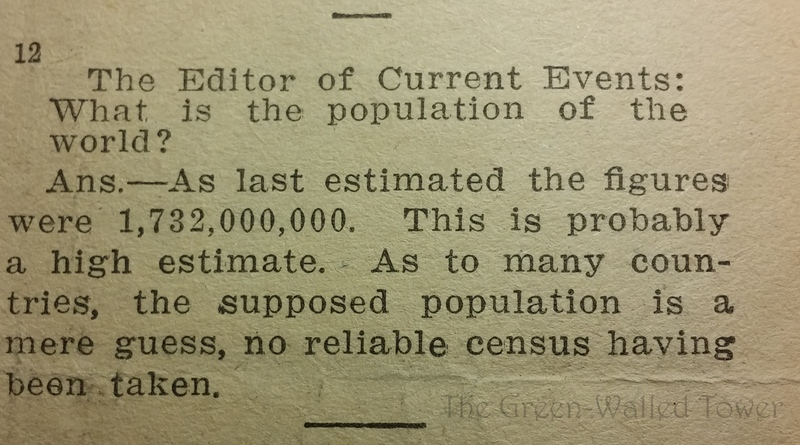 Aww, that’s cute: 1.7 billion people. The world must have felt so empty back then. This surprised me. The Supreme Court didn’t get its own building until 1935. 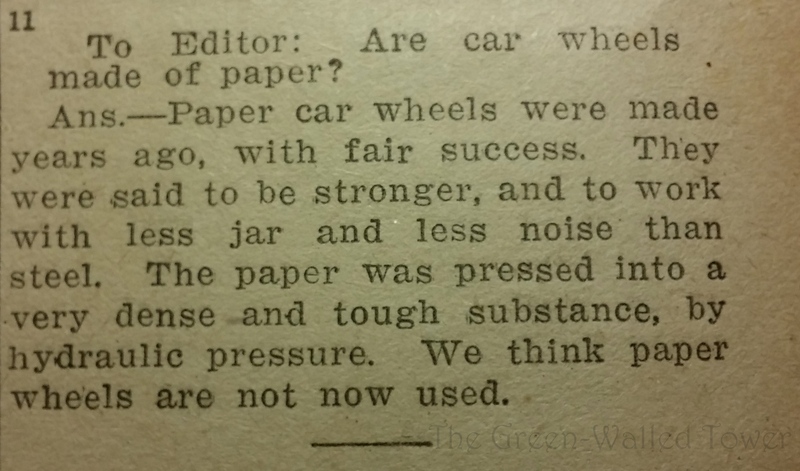 “We think paper wheels are not now used.” I think I’d feel better knowing for sure my wheels weren’t made of paper, no matter how much less jarring there was. Remember DC citizens: when you get that urge to vote, just go for a brisk run or do some yoga or something. Ah, the good old days. For context, that is about the amount of oil the United States currently consumes in 10 days. 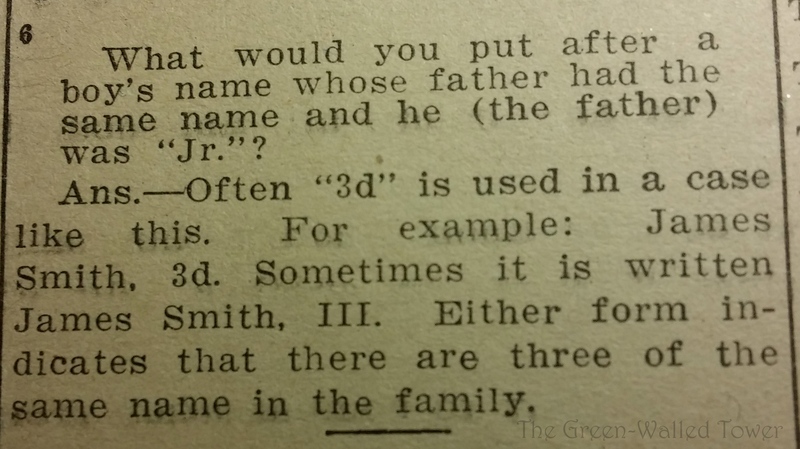 James Smith 3d, unlike his flat father and linear grandfather. 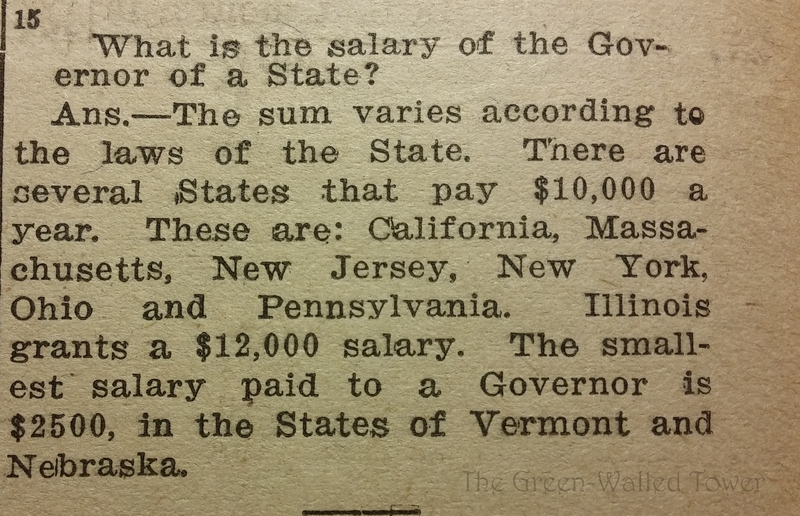 $2500 in 1915 is about $57,000 today, which was about the salary of the average Vermont government employee in 2008. 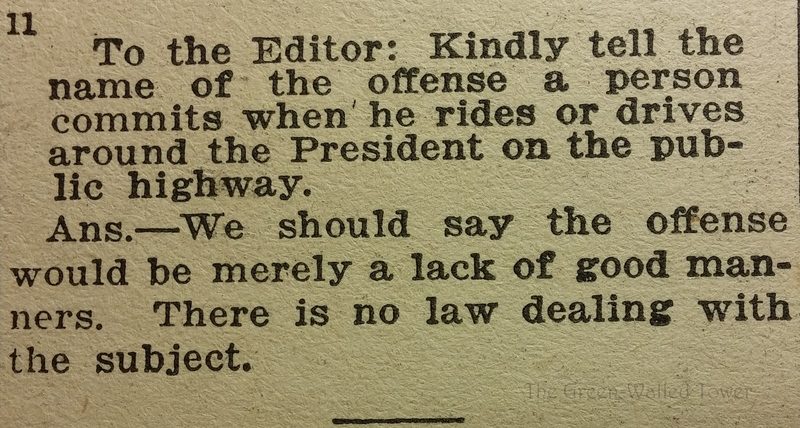 Methinks someone has a guilty conscience about cutting off President Woodrow Wilson on the highway. I think we should annex Cuba right now. See how that turns out. 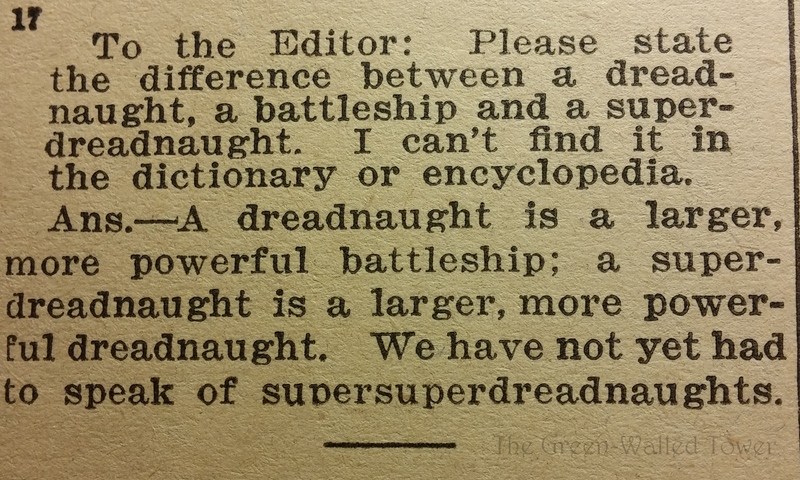 I’m actually a little disappointed that by this point in history we don’t have supersupersupersupersupersupersuperdreadnaughts. Do you like scary stuff? My first piece of original fiction to be accepted by a literary magazine is finally out in print! The story, Bloody Neighbors, was accepted almost a year ago and Issue #14 of Bete Noire just came out this last week. Go buy a copy and read mine and other scary stories. 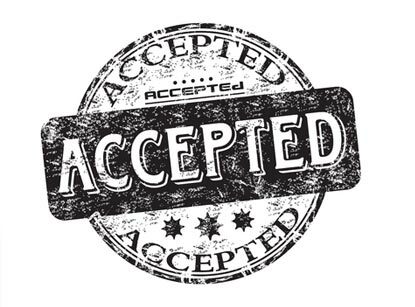 Story Accepted. One down, all to go. I found out yesterday that Bete Noire Magazine has accepted my short story “Bloody Neighbors” for publication in their January, 2014 issue. This is the first piece of original fiction that I’ve sold so I feel good about it. My goal is finish editing all the stories I’ve set aside to submit and hopefully get a few more published in the next few months. 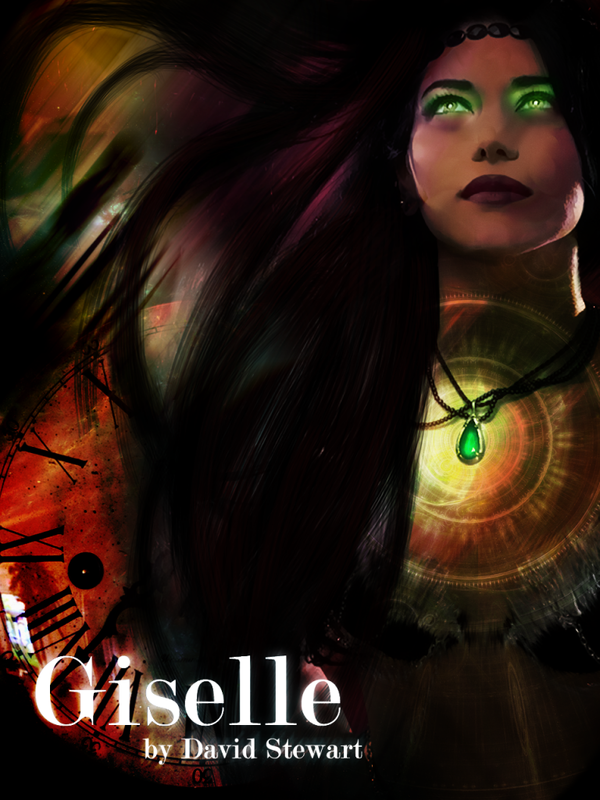 After that, I’m going to start querying agents for my finished novel, as well as editing my other novels. Lately, most of my writing energy has been put towards stories for this blog, but I may have to shift the focus around a little. I will still be posting stories here regularly though, so don’t worry.